The story has a few variations, but goes much like this: Prince Albert Victor was Queen Victoria’s grandson, and second in line to the throne. He secretly married a Catholic shop-girl named Anne Crook, and they had a daughter, Alice. This was not the sort of thing a Royal should be doing, and when Victoria found out, the Prince was whisked away, and Anne locked up. Unfortunately Anne’s fellow shop-girl, Mary Jane Kelly, knew the whole story. Down on her luck in Spitalfields, Kelly turned to prostitution. She and three others tried to blackmail the Prince’s friend, the artist Walter Sickert. He told the Royals, and the Royals took steps to silence the blackmailers. This is where the Masons came in. The elderly Sir William Gull, Physician to the Queen and high-ranking Freemason, was entrusted with the task of silencing this threat to the throne. With coachman John Netley, and the collusion of fellow Masons including Sir Charles Warren, head of the Metropolitan Police, Gull tracked down and murdered the four women, and one more for good measure. These, of course, were the five canonical victims of Jack the Ripper. Perhaps unwisely, Gull chose to silence them in the most public way imaginable. He mutilated the victims in ways that had (alleged) Masonic significance, and left graffiti with (alleged) Masonic clues disguised as anti-Semitic slurs: ‘The Juwes are the men that will not be blamed for nothing.’ ‘Juwes’ apparently referred to three apprentice masons who murdered the architect of Solomon’s Temple. It’s been denied that the word ‘Juwes’ has any significance in Masonic ritual, although Masonic denials should be taken with a pinch of salt. The source for this amazing story was one Joseph Sickert, allegedly the illegitimate son of Walter Sickert. His mother was none other than Alice Crook, the product of the secret royal marriage. Sickert told his story to (among others) a journalist named Stephen Knight, and the book that followed, Jack the Ripper: The Final Solution (1976), popularised the theory. Knight’s research is sloppy, and he apparently ignored evidence that disproved his findings (for instance, Gull and other conspirators probably weren’t Masons at all). He falls into the classic conspiracist’s trap of assuming that a lack of supporting evidence is proof of a cover-up, rather than proof of the evidence never having existed in the first place. Knight’s not-so-final solution has been comprehensively discredited. In its heyday, though, the theory caught the public imagination. The 1970s was the era of conspiracies. Government cover-ups and complicity in crime, from Watergate to the assassination of John F. Kennedy, was taken as read. It was also a time when Britain’s Victorian pomp was being regarded with increasing suspicion. But above all, this was an exciting, fun solution to a famous unsolved murder case. The few credible Ripper suspects were obscure and rather dull. It’s not difficult to see why a conspiracy theory that has the entire Victorian establishment colluding in the murder of five lowly prostitutes is more appealing than any of the more sensible theories. We’d feel let down if he was just another East End nobody. Two films and a TV mini-series have used the Gull theory to varying extents. Murder by Decree (Bob Clark, 1979) pits Sherlock Holmes against Jack the Ripper. The Great Detective’s investigations into the Ripper’s crimes lead him more or less to Knight’s conclusions. Oddly, Gull and Netley are renamed Spivey and Slade (other historical characters keep their real names). Spivey/Gull is shown as a near-catatonic child-man with no responsibility for his actions, with Slade/Netley as unlikely prime mover. The Masons feature heavily, with Charles Warren (a blustery Anthony Quayle) obediently covering everything up. The conspiracy loses some of its power, though, as the government is simply protecting over-enthusiastic Masonic hitmen, rather than ordering the crimes itself. It’s an odd film, and not a terribly good one. Director Clark had previously made good low-budget horror movies in the US and Canada (Black Christmas, 1974; Deathdream, 1974), and it’s disappointing that this feels so much like a TV movie. Christopher Plummer is too bouffant and humane as Holmes (although James Mason is an excellent Watson) and the 1970s all-star cast indulges in some dreadful over-acting. Although the Masonic angle is given a lot of screen time (with Holmes explaining the significance of the Juwes to a sceptical Watson), there’s no real sense that it drives the plot. It’s just a picturesque detail. The film’s main fault is the lack of detection – we’re never told how Holmes figures everything out, nor where his convenient knowledge of Freemasonry comes from. The film lumbers on for 20 minutes after its climax to allow Holmes to explain what happened. There’s also an odd subplot about anarchists, led by rogue cop David Hemmings, who know who the Ripper is and why he’s killing his victims. The very thing the conspiracy is designed to cover up is somehow already common knowledge among the government’s enemies, which makes it all seem a bit pointless and petty. What Murder by Decree did successfully was add a few more tropes to Jack the Ripper cinema. Ripper films could already be relied on to include fog, gas lamps, comedy cockneys and happy hookers. After Murder by Decree, unruly mobs, police cover-ups, psychic visions and sinister black coaches were thrown into the mix. 1988 saw Jack the Ripper (David Wickes), a centenary mini-series produced by Granada. This also fingers Gull, but does away with any Royal or Masonic connection, without which his candidacy makes little sense. Its abandonment of the conspiracy angle makes it of only tangential interest (Granada was playing it very safe in the late 80s, perhaps wary of upcoming changes to ITV franchising laws). 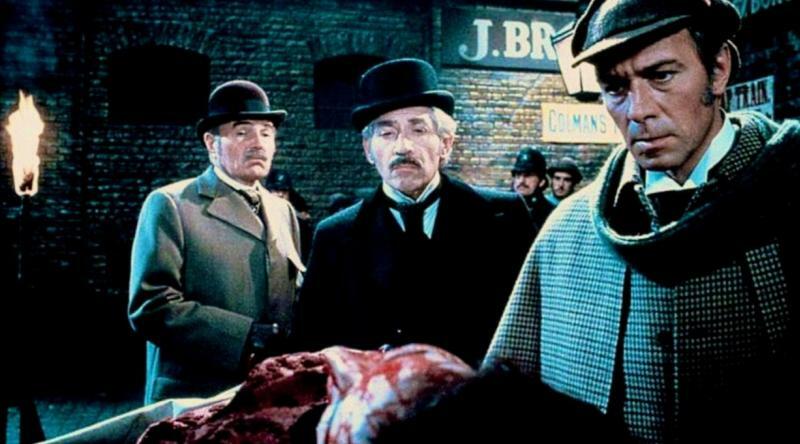 It ladles on the usual Ripper ingredients and, perhaps most importantly, it gives Ripper pop culture its hero, Inspector Fred Abberline. A real historical figure, Abberline was well known to Ripperology (Knight makes him part of the cover-up). But in Jack the Ripper, Michael Caine played him as a boozy Victorian version of Regan from The Sweeney; this really put Abberline on the map. When Alan Moore wrote the graphic novel From Hell, he cast Abberline as his confused everyman hero. From Hell (art by Eddie Campbell, 1991-1996) is the ultimate Ripper conspiracy story. It draws in almost all the important strands of Ripper lore, concocting a huge, overarching conspiracy in which even time itself is complicit. Perhaps wisely, the film version of From Hell (Albert and Allen Hughes, 2001) doesn’t try to cram all of Moore’s ideas into its two-hour running time. Although there are some snippets of Moore’s dialogue, and the occasional shot taken from Campbell’s art, it’s more a remake of the Granada mini-series or Murder by Decree than an adaptation of the comic. Many of its details are from those sources rather than Moore (angry mobs, black coaches, psychic visions etc). It’s more of a conventional Ripper movie than it wants to admit, in spite of the directors’ stated intention to emphasise the social injustice and hypocrisy of Victorian London. This is the most socially aware Ripper film – even before Gull starts his gory work the prostitutes are in mortal danger from a gang of local pimps. From Hell uses the Masonic angle more than Murder by Decree, even showing a minor villain going through an induction ceremony (disappointingly, this sequence doesn’t have the same fetishised attention to detail that the film lavishes on the preparation of absinthe or opium smoking). This scene features a Masonic meeting hall under London, from where the world is ruled by evil aristocrats in funny costumes. The film could have done with more of that. As it is, the emphasis is very much on Abberline (Johnny Depp) as the classic ‘man who knows too much’, and his unconvincing romance with Mary Kelly. A scene in which Abberline learns all the Masons’ secrets from a book in a seemingly public library makes you wonder why the film uses the Masons at all. If they can’t even guard their basic rituals from public exposure, how effective a secret society are they? That’s the problem with these Masonic Ripper movies. The fact that it’s the Masons, as opposed to any other shady organisation, is largely irrelevant. They’re prominent in Joseph Sickert’s original tall tale, and Stephen Knight was obsessed with them. Alan Moore weaves the Masons’ gloss of mysticism into From Hell reasonably well. But while filmmakers have gratefully seized on the visual trappings of Masonry for an easy way to identify the villains – a ring here, a tiepin there – there’s never any sense that it has to be the Masons as opposed to, say, the Illuminati, or even Fu Manchu. The Ripper is now inextricably tied to conspiracy theory, despite the best efforts of credible researchers; but as far as the movies go, it doesn’t seem to matter which conspiracy theory. As part of their ‘Secret Societies’ day, the East End Film Festival will screen From Hell, Dark Days and Brotherhood of the Wolf in a Masonic Lodge. More details on the East End Film Festival website.